In conversations with Class A Peoria pitching coach Cale Johnson and catcher Dennis Ortega, Zach Prendergast figured out the best route to success Thursday was to be as unpredictable with pitch selection as possible. That approach proved more than enough to get the job done. 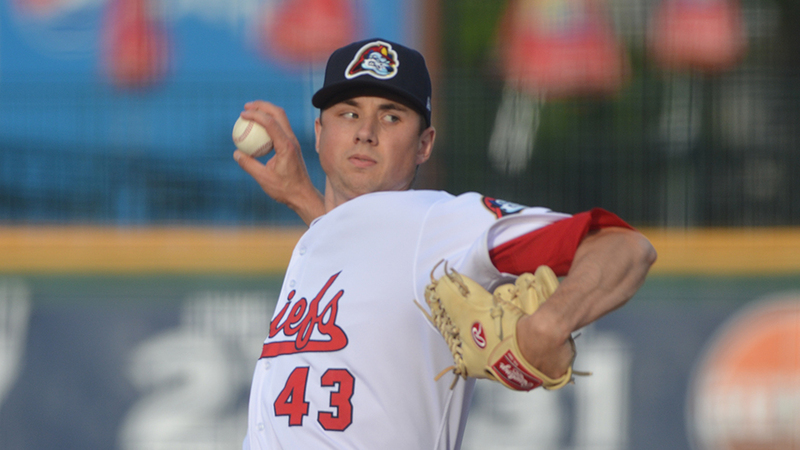 In Game 2 of the Midwest League Finals, the Cardinals right-hander allowed two hits and a walk with seven punchouts over 6 2/3 scoreless innings as the Chiefs evened up the best-of-5 Midwest League Finals series with a 2-1 victory over Bowling Green at Dozer Park. "This is a team that they're going to mix well, so I was using all four of my pitches to kind of keep them off balance," Prendergast said. "I was kind of pitching backwards to some guys and other guys I was kind of pitching straightforward -- starting with fastballs and ending with breaking balls. I feel like what kept me in the game was getting a good mix and throwing all my pitches for strikes." Keeping the ball effectively in the zone had worked well through his first two postseason starts this season as he allowed just two unearned runs and five hits with 18 strikeouts across 11 frames. Prendergast stuck with that concept in the Championship Series, throwing 64 of 97 pitches for strikes and allowing just five balls to leave the infield against the 23 batters he faced. Perfect through the first 11 hitters of the night, the 23-year-old relented when Taylor Walls took a free pass with two outs in the fourth inning. He was ultimately stranded when Jim Haley popped out to short. "I knew before the game with our scouting report who [from Bowling Green] would maybe be better to pitch backwards to -- starting with breaking balls and changeups," Prendergast said. "Throughout the game, you see how they're seeing it and their swings on it and kind of their approaches. Second time through the lineup, you kind of make adjustments. But that was pretty much it. We stuck to the gameplan the first time around, and the second time, we just kind of continued with what was working." Seventh-ranked Rays prospect Ronaldo Hernandez smacked the first pitch of the fifth into left field for a double for the Hot Rods' first hit, but he got no further than second as Prendergast set down the next six. After Walls led off the seventh with a leadoff single, the right-hander fanned Haley and got Hernandez to fly out to right before ceding the game to the bullpen. With the game still scoreless thanks to a strong start by Tommy Romero, Prendergast exited with a bit of uncertainty. "You can't relax when they have a guy throwing up zeros for them," the Seton Hall product said. "So you've got to continue and not blow it out of proportion. You have to understand that the offense has been coming around all year and we knew it was going to be no different today." The Chiefs broke through against Romero with two runs in the seventh to take the lead. Rayder Ascanio cracked an RBI single into right and second-ranked Cardinals prospect Nolan Gorman scored on Nick Plummer's double-play ball. No. 12 Rays prospect Vidal Brujan plated a run with a sacrifice fly in the eighth, but Kodi Whitley worked around two hits and two walks to earn the save. The two teams will play Game 3 at Bowling Green Ballpark at 7:35 p.m. ET on Saturday.